You’re making a significant investment and want to ensure your environmental liabilities are covered. You turn to an environmental firm to complete a Phase I ESA. So far, you are taking the right steps to lead your project to success. Yet, as you order your Environmental Site Assessment, do you know exactly what you should receive? What should be on a Phase I Environmental Site Assessment checklist? Not all environmental firms are created equal, and not all Phase I ESAs offer the complete assessment you need for your project. It’s essential to partner with a firm that delivers comprehensive services, and to order a Phase I ESA that covers all your bases. As you initiate this endeavor, look for the following crucial components of a Phase I ESA. 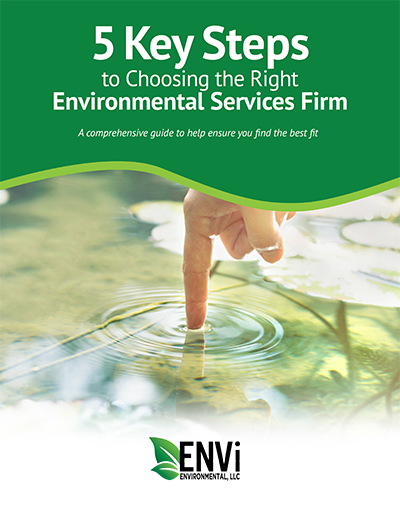 Use the questions provided to properly vet any firm you are considering partnering with for your environmental needs. Historical data: The environmental firm should complete extensive research to discover the history of the property. How has the land been used in the past? Does it have a history of issues? This historical data search should include more than a local records review. It should involve personal interviews with parties knowledgeable of the property and a review of historical documentation such as maps that establish when the property was first developed and how it has been used since that date. Ask: What methods do you use to research the history of the property? Adjacent property evaluation: Closely tied to the historical research piece is an evaluation of adjacent properties. It’s important to look at the surrounding land and structures and their current and previous use as well as the subject property. This evaluation will determine the potential influence the adjoining properties have on your land. Knowledge of the local area, its history, and any ongoing challenges will prove advantageous for this piece of the Environmental Phase I Assessment checklist. Ask: Do you evaluate surrounding properties? What is your level of knowledge and experience with this region? Site reconnaissance: The final Phase I ESA report should include any potential sources of past, present, or future environmental issues. The environmental firm must complete thorough site reconnaissance to reveal these concerns. The recon should include heat sources, storage tanks, fill materials, plumbing systems, water damage, and building construction. Ask: What kind of site reconnaissance do you complete to determine my environmental risk? Clear results: You must be able to use the results of your Phase I ESA to make an informed decision about your investment. The report should guide your purchase and help you determine what price is reasonable for the property based on its condition. The findings and recommendations should be thorough and clear. Ask: How do you prepare reports and what do your findings and recommendations include? A lot of companies can provide a Phase I ESA, but not all offer the specialization needed to provide a complete checklist of services. It’s essential to partner with an environmental firm that delivers reliability, quality, and experience to ensure the future success of your project. Equipped with a comprehensive portfolio of services, ENVi Environmental is your premier local source for a complete Phase I Environmental Site Assessment checklist. With every Phase I ESA, we deliver clear communications, full transparency, and thorough reports. Detailed and comprehensive Phase I ESAs that are compliant with the ASTM 1527-13 as standard practice. More than 20 years of local experience that provides comprehensive knowledge of the regulatory requirements in Cleveland. ENVi 360™ Solution – Full spectrum of environmental services: due diligence, remediation, permitting, waste management, and compliance. Consistent, detailed methods that result in a high approval rate for the projects we submit to regulatory agencies. Contact our team today to find out more about our Phase I Environmental Site Assessment checklist and how it can benefit your business.